Very small particles of dust are not usually visible to the naked eye. However, if we use special lighting techniques we are able to see them. 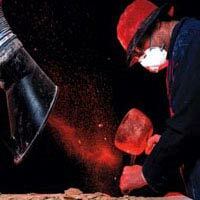 In this image, special lighting and photography have been used to show the plume of dust that is made when this stonemason chisels a stone block. Some of this dust could not otherwise be seen. It also shows how even when an extraction vent is in place some of the dust can escape. 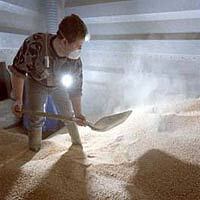 In this image, a strong light beam reveals the airborne dust that is created by this worker shovelling grain. Normally, this dust would be almost invisible. In this situation, you cannot use water to suppress the dust, as it will spoil the grain. Full respiratory protection should be used, with a well-fitted, filtered respirator.